I have jumped back and forth from this and the vtac and the HK vp9, this him just had to many features to not give it a try for the price. I have Springfield armory xd's and Smith and Wesson m&PS , have to try a sig. because of the positive reviews & the brand. Want to try USPSA Carry optics and this seems to be the perfect gun for it. I have many 9mm pistols but wanted a next level competition platform that I can turn into a high level target shooter. Best price by a mile. Great customer service as well!! 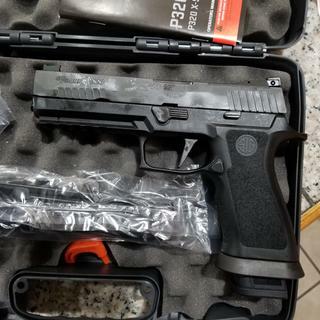 Wanted a full size gun for USPSA. This one seems to fill what I was looking for in 9mm. This was by far the best price I could find on this model. Over $100 cheaper than anywhere else. BEST ANSWER: yes. the grip has no thumb rest so it is the same both ways. there is a slide release on both sides. the mag release comes on the left side but can be changed using a paper clip as a tool. I saw the price has come down too. The mag release comes installed for righties, however that can be moved to the other side with no issues. Excellent gun with no issues with about 5,000 rounds so far. Yes but you will need to flip the magazine release. The slide release is already on both sides. It does not have a safety, and the take down lever and slide stop are on the left side. Yes it is. You can move the mag push button to the right. If you are left hand. Does this have the new black barrel? What is the grip module size? Is it small or medium? BEST ANSWER: I think I would consider it at least a medium size frame. It compares to my glock 21 but the feel is that of a smaller size. It just seems to fit the hand better. Love this gun, shoots like a laser. Best trigger of any gun I've ever shot. 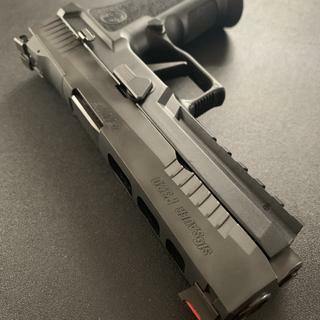 Going to be buying another sig because of this gun. I’m overseas so I haven’t put hands on the product yet but my shop told me everything that was supposed to be there was present and the gun appeared immaculate. 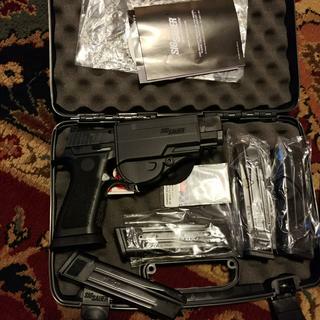 I gotta say I ordered the gun on a holiday weekend and it was at my shop two days prior to the anticipated arrival. The website folks wasted NO time getting my order processed and shipped. Thanks y’all for prompt service. I look forward to getting home and going hands on. The X-Five was my first purchase from Grab-a-Gun and it will not be my last. Customer service up front before the purchase was fantastic, the purchase was smooth, shipping incredible fast and the X-Five was perfect when it arrived. I have shot 500 rounds in the first two range sessions with the X-Five. Function has been flawless so far. Trigger was nice out of the box, gun is incredibly accurate and fun to shoot. X-Five after swapping out the green fiber optic for red. It has everything you need for match use. They even include 4 21rd mags. I mounted the Sig reflex sight and shot a 21rd 1 inch group at 12 yards. Mag changes are lightning quick. This gun cost a bit but life is too short to waste on cheap guns. This is an amazing gun. It is very smooth and accurate. It is extremely comfortable (In my mid size hands). 4 mags 21 rounds. A real pleasure to shoot. Still breaking it in, but so far so good. Consistent groups even while not broken in. I have big hands and this pistol fits perfectly. The P320 X-Five 9mm incorporates all of the most important features demanded by tactical and competitive shooters into the P320 platform. The X-Series grip module is exclusive to this line and features a deeper trigger guard undercut, a higher back strap and an extended beavertail to ensure a higher grip for better recoil management. It also comes standard with a removable grip weight for improved balance, as well as a removable magazine funnel and extended slide catch lever to facilitate faster reloads. The X-Five includes a straight trigger that breaks at 90 degrees for a better feeling pull and the 5" bull barrel and lightened slide pair perfectly for match-grade accuracy. The slide is equipped with Dawson Precision® Fiber Optic front and fully-adjustable rear sights and additionally, the rear sight plate can be easily removed as a unit and replaced with a ROMEO1 optic. Each P320 X-Five includes four (4) 21rd steel magazines.